Google might have some big surprises in store. Or not. Pixel 3 XL conspiracy: So what’s real? c) dropping careful hints that only people in the know would be clever enough to catch. That’s quite a trick for any company to pull off, let alone of the of the biggest and most scrutinized companies in the world. So how on earth did such a zany theory get started? And is there any shred of it that’s credible? I decided to investigate. As most Internet-based conspiracy theories, it started with a viral video. On August 5, Jon Prosser put out a Front Page Tech video titled, “GOOGLE FAKED ALL THE PIXEL 3 LEAKS AND BAMBOOZLED US! ?” (emphasis his), which tracked the “absolutely insane” theory that the rampant Pixel 3 leaks you’ve seen all over the Internet were all part of an elaborate head-fake by Google. In the video, he examines EA Sports’ Madden commercial, the Android P beta, and last year’s Pixel keynote to surmise that there could be a third “Pixel Ultra” phone in the works that we hadn’t seen yet, with no notch and barely any bezels. He’s since published several follow-up videos that all point to the same theory: Google is purposefully leaking everything about the Pixel 3 and Pixel 3 XL because there’s a third phone that’s even better. Even Prosser said we should take his theory with a grain of salt, but this being the Internet, that didn’t stop it from spreading. Front Page Tech’s video was quickly followed up with a vid by M. Brandon Lee on his This is Tech Today YouTube channel that attempted to push the conspiracy one step further with some real-world evidence. Even though the video was getting some 9,000 views per hour, a pace Lee had never experienced before, he quickly pulled the video and published a new one where he apologized and explained his thinking. 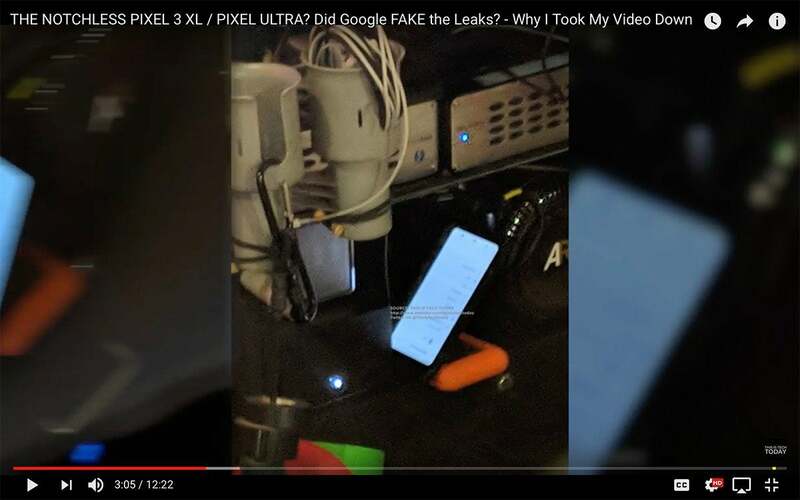 But that didn’t dampen interest in the Pixel Ultra: Lee’s follow-up video is his most-watched yet, with nearly 100,000 views and more than 500 comments. Right on cue, Lee followed up with a new This is Tech Today video with his own information “from a source at Google” who claims the Pixel 3 XL leaks are part of a viral marketing campaign designed to “set certain expectations and blow them out of the water.” For his part, Lee says Google hasn’t contacted him directly and he’s “not entirely sure they know I exist, to be honest.” However, Lee believes that Google is indeed making a montage of less-than-flattering clips about the Pixel 3. I reached out to Google for comment and will update this post when I hear back. And there certainly is evidence there if you’re looking for it. My guess is that Google is putting together a humorous video of clips that show how crazed people are over the Pixel 3, but there is a sliver of hope that Google’s has a surprise in store for its October 9 event in New York City. And with a month to go until the big event, you can be sure that this theory isn’t going away anytime soon. This story, "Pixel 3 XL notch conspiracy theory adds intrigue to Google's Oct. 9 phone launch" was originally published by PCWorld.